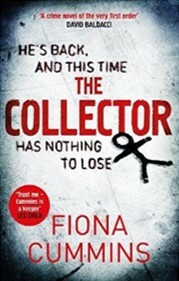 An obsessed serial killer, called The Bone Collector for his interest in particular physical deformities is moving towards a final coup in which he hopes to complete the killing spree he began in a previous book and to destroy the detective who defeated him. This novel opens in a very discursive manner with short chapters on different individuals. After four of these we move to a day-by-day account which still hops between different protagonists. Obviously the repetition of characters’ experiences forces them into the reader’s mind but I was rather confused for a while, though readers of Cummins’ precursor Rattle will be less so. It appears we have a serial killer who has an obsession with particular physical characteristics in his victims. He is known as the Bone Collector and he is apparently desirous of dealing with Jake, the child who got away from his previous spree, and the detective, Fitzroy, who thwarted him then. The tension of whether potential victims have or will survive is powerful, particularly as they are children. Clara is a little girl who has disappeared, we learn this at the beginning of the book and why she is a suitable choice for the Bone Collector. Other children are embroiled in the story. The very short chapters do enable a moving focus on each situation of a child or the adults around an endangered or missing child. Gradually a thread of story develops and the disparate characters move together. Finally a climatic series of events brings closure. This is cleverly written thriller, though a warning - as the novel conveys viscerally unpleasant descriptions, as the subject matter is horrific and the narrative concentrates on The Collector - a man within whose head I do not want to enter.